Dan Hinge: Where do you get your ideas? According to writers who are more popular than I am, one of the most common questions they are asked is: “Where do you get your ideas?” So this week I thought I would discuss where babies stories come from. Most of this takes place in my head. I have always found writing plans down to be a waste of time because I’m just putting down what’s in my head anyway. And when you’ve written it on a piece of paper it can’t be changed easily. Thoughts, however, are malleable. This is where a story goes from not being into being, but it’s pretty anticlimactic. Normally the trigger for a story is something tiny and daft that gets me thinking. In the case of my current project, La Matadora, when I was younger I found a random story generator on the BBC website. 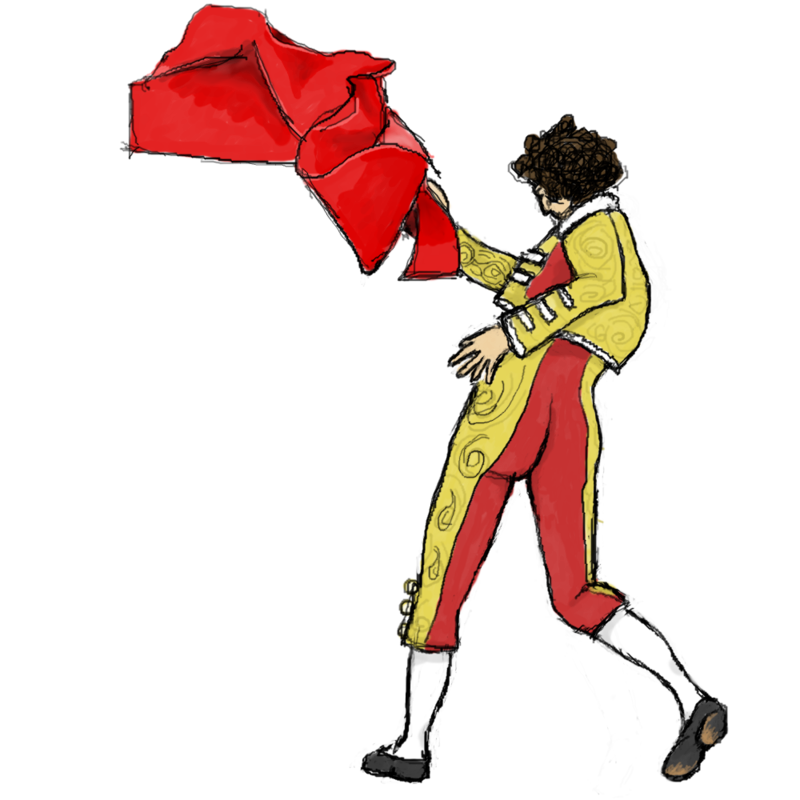 One of the character suggestions it gave me was “a matador” – which I really liked, but never got around to using. The Great Global Aeronautical Race germinated from a film I don’t think I even watched, while The Mad King of Garnacha came from the label on a bottle of wine. A grain of an idea is not much use, so this stage involves thinking about how I can make it work as a narrative. My immediate thoughts on the matador were that the setting – hot, sultry Spain, the gritty sand of a bullfighting arena, shouting crowds, blood – all sounds cool, but there’s not a huge amount of stuff you can do with a matador. They kill bulls. That’s about it. I also know next to nothing about bullfighting, although research is always an option. First I thought, well, bullfighters are always men. That’s dull. My matador is going to be a matadora. Next I thought about the word itself, meaning “killer” in Spanish, and (sort of) synonymous with assassin. That works, I thought. I’ve played Assassin’s Creed. I know tons about assassins. As a setting for the hunt I wanted somewhere claustrophobic, but also vivid and full of descriptive potential. A party. And I wanted heat - a party in Spain. With a heap of mismatching ideas in my head, stage two flops unceremoniously into stage three. Next I thought about characters. Most assassins don’t seem very philosophically involved with the act of killing, which seems odd to me. James Bond generally just does it – he’s too cool to worry about philosophy, and there’s always a clearly-defined baddie. Agent 47 is cold and uncaring by design. I wanted an assassin who kills because she thinks it’s right. This gave me the idea of having a philosophical discussion between killer and target while he bleeds to death on the floor, but I ditched that because...pretentiousness. Then I thought it would be great to make the reader figure it out for themselves – I just read a story called Rain by W Somerset Maugham, where the whole time the reader is thinking Is he doing what I think he’s doing? No, surely not... Maugham never comes out and says it, but you just know. Ok. I can do that. So that gave me the structure of the story. Part one is told from the perspective of the target, part two from the perspective of la Matadora. This gives potential for a whole lot of paranoia, and also quite a bit of black comedy, which is something that I’ve wanted to try for a long time. Limpet was an attempt at it, but it came out more like farce-with-the-imminent-threat-of-death than black comedy. Here we have a man so tied down by social convention that even though he thinks he is about to be killed, he insists on making sure his guests are all comfortable. Must be British. He also doesn’t know who the killer is, and obviously the reader won’t either. By now I have what I consider to be a reasonably solid premise for a story. I think I’ll enjoy writing it, and there’s loads of potential for good description and dialogue and hopefully a rollicking plot as well. Trouble is, the pieces don’t fit together. This is a stage I hit with pretty much every story, and I don’t always solve the problems as well as I’d like, which is why the ending of Stop the Press isn’t great, for instance. The main problem in this case, is Why? Why does she want to kill him? But also: how can I possibly justify her decision to kill him? How does he know about it? And does he escape? The last question is relatively unimportant. The story is about the chase, not the kill. But the why and the how are important, because my killer is not a drone, nor is she so unquestionably in a hero vs villain situation (i.e. James Bond) that she can kill without further justification. I want this to remain in a moral grey area – all of the interest is immediately bled out of the piece if I just take the easy route and make the target an arms dealer or puppy murderer. But thinking of a good justification for killing is tricky, which may be why so many stories just ignore the problem. Normally when I am stuck at this stage I will just start work on the bits I know I want to include and then see how they fit together. Often as characters interact with one another you get a better feel for how they respond to certain situations, and that makes it easier to set up a situation that will provoke an interesting response. When a story is this far advanced in my head, the problems normally solve themselves. It may require some quite major changes – for instance I needed to structure the parrot-chew into Limpet so that Two Plank could use it later. With the novel I am buried deep in stage four, because all of the problems are multiplied by a hundred and then squared. Sometimes, however, a story will just die. This normally happens when I skip straight from the cool idea to writing it, and then realise I don’t have anything more than an image that I have put on paper. But if I put a bit of effort in, that’s quite easily avoided. So, other writers: where do you get your ideas? Hello! Grand post - you've really got this whole 'writing' lark. I was wondering re. The Matadora - have you read 'Mrs Dalloway'? Two completely opposite main characters with a brutally clear resolution for only one - maybe you could use that sort of technique? Anyway. Just a thought! I'm sure you've had others. Hi! Thanks - now I just need to get the writing it all down bit fixed... I haven't read Mrs Dalloway - sounds like an omission I should correct sharpish! I love the image of a tailspinning idea, sounds much more exciting than mine, but I can see that it might not be the best way of getting things down on paper. Would you like to write a novel? I think the original idea is probably a mythical beast, but I reckon it's worth commissioning an expedition to search for it, just in case. I like your blog by the way. Did I tell you that already? I meant to. Have you published any of the results of Parker/Sophocles?